For her tenth full-length album, 'Ruby', Macy Gray, reaffirms and reasserts that rare space in the canon of modern music, which she occupies. Channeling the spirit of the "grimy" R&B and smoky jazz closest to her heart, Macy made a leap forward by looking back to formative inspirations. However, she updated those elements with enriched, entrancing, and enigmatic soundscapes brought to life by producers Johan Carlsson [Michael Bublé, Maroon 5], Tommy Brown [Jennifer Lopez, Fifth Harmony, Travis Scott], and Tommy Parker Lumpkins [Janet Jackson, Justin Bieber]. Take the first single "Sugar Daddy." Co-written with none other than pop superstar Meghan Trainor, the track swings from jazz-y piano into a cooing verse that's as sweet as it is sassy. Her voice takes hold on the hook, "Be my, be my sugar daddy and provide me with your candy." "Meghan and I thought it be great to collaborate," Macy recalls. "She had the concept in her head for some time, so we took a stab at it. It's really great fun and a bit cheeky. Her writing and talent is brilliant. It was the perfect song to come out with first." ‘Ruby’ canvases a wide spectrum for the songstress. Raucous horns that feel ripped from a classic seventies flick augment the grit on "Cold World" as "Jealousy" spins a covetous narrative that soars as it seduces. Gary Clark Jr. adds six-string firepower to "Buddha." Everything culminates on the reggae-inspired "Witness," which shuffles between mainland soul and island grooves as she croons, "I wish I was Jesus. I would make sure to fix it. Can I get a witness?" 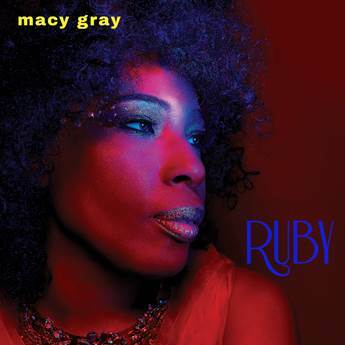 In the end, ‘Ruby’ represents Macy Gray at her most passionate, poetic, and powerful.